The grim economic picture darkened further today with news that the price of ink for printer cartridges has reached an all time high of $1000 a barrel on the New York futures exchange. The world’s most traded commodity has seen a steady rise in price over recent months due to supply problems, increased demand from China and a failure of consumers to send their empty cartridges to the charity recycling centre and just leaving them in their desk drawer instead. New cost-of-ink-per-page analysis of ink cartridges is a new way for customers to estimate their printing costs. QualityLogic, a company providing quality assurance and control services, reported it had completed Cost-of-Ink-Per-Page (CoIPP) Analysis for the Eastman Kodak Company. CoIPP Analysis uses cartridge cost and page-yield to calculate and compare the cost of ink required to print one page on Kodak EASYSHARE 5100, 5300 and 5500 All-in-One Printers to 11 competing printers. Page-yield is determined by Certified Page-Yield Test Program, QualityLogic’s special software based on ISO standards determines. Cartridge prices in UK, France, and Germany were provided by IDC, a provider of independent market intelligence. QualityLogic published a paper that you can view for details, but here is a briefly overview of what results of the analysis show. Naturally, all three Kodak’s printers demonstrate lowest cost of ink per page in monochrome, color and photo printing. For instance in UK, one page printed on any of Kodak Easyshare printers in mono, color and photo mode costs 0.016, 0.047 and 0.064 GBP, or $0.033, $0.096 and 0.131 respectively. It turns out the most expensive printer inks among the compared are for Hewlett-Packard’s Photosmart C5280 followed by Photosmart C4280. A page printed Photosmart C5280 in monochrome mode would cost 0.065 GBP; in color mode – 0.148 GBP; in photo mode – 0.311 GBP. Converted into US dollars, that’d make $0.137, $0.302 and $0.636, respectively. Of course, actual prices in USA will vary, but the example gives us a general idea of cost difference scale. Not so long ago a study initiated by HP found that HP ink cartridges contain inks twice as much as remanufactured and refilled ones. 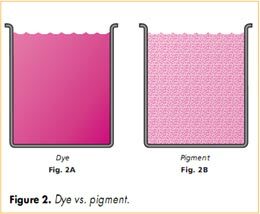 Some time before that, an ink study sponsored by Epson found that Epson genuine inks provide stronger color-fading resistance and, thus, longer life of printed images. Just like these studies, the QualityLogic’s analysis is not completely independent and unbiased. 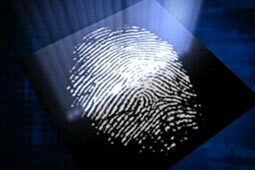 However, such CoIPP analysis provides consumers with information that is fair, accurate and consistent. It gives them a new way to look at this portion of the overall cost of owning and operating a printer. Recent study show customers have no basis for comparison when buying printers, which results in $6 billion overpay on ink every year. The American Consumer Institute released a new white paper entitled “Inkjet Prices, Printing Costs and Consumer Welfare” disclosing pricing strategies adopted within the inkjet industry. This is the first document made by public organization (we don’t consider numerous articles on the topic in magazines and sites by independent authors). Inkjet printers are usually under-priced or even sell in the red to make them more appealing for purchase. However, the manufacturers make up the profit on overpriced ink, and consumers are left with no choice and spend hundreds of extra dollars to operate the printers. The printer ink is currently one of the most expensive liquids in the world. The price of it can be compared with that of the world’s finest champagne, gasoline and most luxury fragrances. Currently, there’s no standardized printer ink unit pricing, such as cents per printed page. In this situation, customers at the shop have no information about real printing costs. They buy cartridges without knowing how much ink is in them or how many pages one cartridge will print. The lowest price cannot serve as the rule of thumb, because very often the lowest priced cartridges have much less ink. The paper also suggests that adoption of a form of truth-in-labeling would allow customers to compare each printer’s cost-of-ink per printed page. The paper concludes that competition in the inkjet printer and ink sectors would be much more intense if consumers were made aware of the cost implications of their printer choices. Better information means lower costs for consumers. I believe this is a good start. If more public organizations begin informing consumers on the issues and thus affecting the manufacturers, the situation with overpriced printer ink may really change for the better. 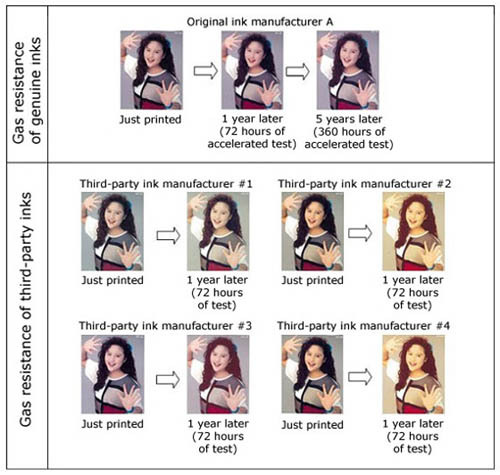 This post may be interesting to you if you own a Canon or Epson inkjet printer and still can’t decide whether to use genuine of compatible inks to print your photos. This post will, probably, make you feel disappointed if own a Canon or Epson inkjet printer and chose compatible inks to capture the moments of your life into paper with compatible inks. This post will make you feel proud of using genuine inks for your Canon or Epson printer. Let’s get to the point. 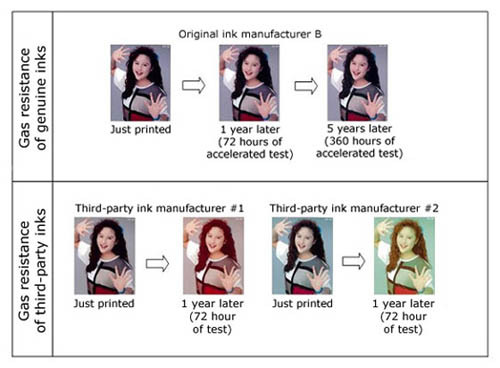 Allion Test Labs, Inc. a Taiwan-based company that verifies product quality and interoperability of PCs and PC peripherals, has tested color fading of inkjet-printed photos using OEM inks and third-party manufacturer’s inks. Allion was hired to do the test as independent tester and didn’t reveal the relations between test results and the ink manufacturers names. It’s only known that the evaluation was done using two printers: one by Seiko Epson Corp, the other by Canon Inc. In the accelerated gas resistance test a mixture of gases is used to simulate aging of a photo, so that one year of real life can be tested in 72 hours (if you are interested in the actual gas formulations, visit the original news page). Once again, it’s clear that original inks are more fade-resistant than compatible ones. So, folks, if you are keen on printing out Japanese girls on your Canon or Epson inkjet and want them to last the longest, you’d better stick with geniune inks Otherwise, watch for photos fade out over time. Studies, researches and surveys… how little we would knew without them. Another test of ink cartridges efficiency was commissioned by TÜV Rheinland for Epson. The idea of the test was to find out how much ink is actually wasted every time a cartridge is thrown away. The thing is, many inkjet printer and multifunctions use multi-ink cartridges, e.g. cartridges containing three or more color. When you print photos or graphics, one color inevitably runs out faster than others, and printer says, “Oops, you’re out of ink”. However, cartridge usually does contain some amount of other than depleted colors. Despites, you need to go shopping for another cartridge to print further. Not only wasted cartridges with ink do cost you more in terms of upfront cash and cost-per-page effectiveness, they are also environmentally more hazardous than just empty cartridge. With single-color cartridges there’s no such problem, the ink is used completely (well, actually not completely, I won’t be a nerd on this point). And the single-color cartridge might be one praised and promoted in this test, since Epson uses such cartridges widely in its printers. Anyway, the results of the research are terrible: up to 50% per cent of ink is wasted when printing business documents. Making photos is a bit more ink-use effective – “only” 40% is thrown away. It’s worth mentioning that cartridges tested (both single and multi-ink) presented multiple brands, including Epson, Lexmark, Canon, HP, Kodak, and Brother. By the way, the first prize went to… Epson, who else did you think?